Ann is a social justice advocate who comes to Tree of Life with more than 20 years of experience in administrative management for both for-profit and nonprofit businesses and organizations. With a strong background in nonprofit development and communications, she is well positioned to help us at Tree of Life to strengthen our fundraising efforts, grow our membership and reach a wider audience. 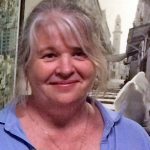 Since 9/11 Ann has been a passionate and knowledgeable advocate for justice for Palestine. Upon her move to Connecticut, her top priority was to search online for those already engaged on this issue, which is how she found Tree of Life Educational Fund and the First Congregational Church of Old Lyme! “Working on behalf of justice for Palestine has been a dream of mine for many years, and though the struggle often feels hopeless, I do find hope in the many people and organizations who work daily to share the stories of Palestine, who support the ongoing efforts to seek justice, peace and understanding, and in those who support the ongoing needs of the Palestinian people and refugees,” said Ann. Ann currently lives in Mystic with her husband, Whit. They have two grown children living nearby whose company they treasure and seek out as often as possible.